Weaver, considering future support for Wrinch, asked Pauling what he thought about her work. Pauling was not favorably inclined. He remembered seeing a news article featuring a photo of her "fondly holding her elaborate model of a globular protein," and believed, from the grainy photo alone, that her cyclol cage was too empty, too delicate to account for the known densities of the molecules she was attempting to model. At Weaver's urging he met with Wrinch while they were both in Cornell. When their talk was over, he made a devastating private report to Weaver. She was too much the mathematician, he thought, "interested in the rigorous deduction of consequences from postulates rather than in the actual structure of proteins." He found her general knowledge facile and shallow, her specific knowledge of the protein field superficial, her conclusions unwarranted. There was no good chemical reason Pauling could see to dictate a cyclol structure containing 288 amino acids. He still believed in long-chain models, because they better fit his understanding of the energetics of the chemical bond. He concluded that Wrinch's cyclol papers were, he wrote, "dishonest." Those who believed her data, he added, were "deluded." The only positive thing he got from his meeting with Wrinch was a burst of energy around his own protein research. He now had a mission: To demolish the cyclol theory and focus the protein community's work back on long-chain molecules. He expanded the number of people in his laboratory who were working on proteins, adding, among the new hires, a talented protein researcher whose structural ideas agreed with Pauling's. His name was Carl Niemann. Together, the two of them wrote a paper published in 1939. "The Structure of Proteins," published in July, was a full-throated attack on Wrinch's ideas and defense of Pauling's. The strongest arguments were chemical, drawing on Pauling's broad and deep knowledge of the field, demonstrating how unlikely cyclols were because the structures required more energy to build than chain molecules. "We draw the rigorous conclusion that the cyclol structure cannot be of primary importance for proteins," the paper concluded. With those words, the protein career of Dorothy Wrinch was finished. Pauling and Niemann turned out to be right. Cyclols do exist in nature, but they are extraordinarily rare. Pauling was on the right track. See Also: Letter from Warren Weaver to Linus Pauling. February 11, 1937. See Also: Letter from Linus Pauling to Warren Weaver. March 6, 1937. See Also: Letter from Warren Weaver to Linus Pauling. March 11, 1937. See Also: Letter from Linus Pauling to Carl Niemann. April 19, 1937. See Also: Letter from Linus Pauling to Carl Niemann. August 6, 1937. 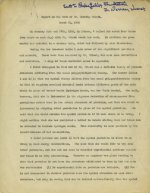 "Report on the work of Dr. Dorothy Wrinch." March 31, 1938. 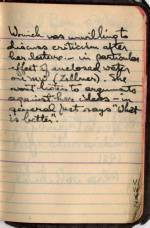 Pauling Diary: "1937. Also 1938-9." 1937 - 1939.